Big Bang is a South Korean boy band. This group consists of 5 persons, each having a different sound or rapping parts. Before launching their career with a major record company, each member of the Big Bang is no stranger to the world of entertainment. G-Dragon, the leader, and Tae Yang has been a member of YG Entertainment since they were 12 years old. Both are known as "GDYB" which stands for both of their names 'of G-Dragon GD and YB' of Young Bae (Tae Yang's real name). 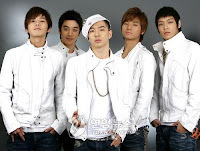 Members named TOP known as underground hip hop rapper while Seung Ri first entered the entertainment industry in the world when it included in the show belongs to Shinhwa, "Let's Cokeplay Battle"
After a full member of the Big Band, television network MTV Korea made documentary that includes 10 episodes on their activities during their training before being launched as a boy band. Episode 6 The first section detailing the motivation and background of the amhhpya to become a singer. The documentary describes the training process is very heavy like dancing and singing sessions. Two members, SO-1 and Seung Ri has been considered not to be included, but they are given a chance to show off their skill in dancing and singing. But Yang Hyun Suk (CEO of YG Entertainment) finally issued a SO-1 because he was deemed "too timid". Meanwhile, Seung Ri makes Yang Hyun Suk was impressed by the skills of its singing and dancing, and was chosen as a member of Big Bang. Video documentary was made to commemorate their most severe, the members of Big Bang before becoming stars in the Korean entertainment industry. When many boy bands that have a type that cute singer, producer YG Entertainment to tarnish the image of cute, and create a boy band that could actually sing. Before making his debut as the Big Bang, the personnel had suggested several names such as Apex, Stump, and Diamond. Yang Hyun Suk, producer and founder of YG Entertainment considers the proposed names were too childish, and set a new name, the "Big Bang". Big Bang was officially commit their first appearance at the YG Family concert, August 19, 2006 at the Gymnastics Arena, Seoul Olympic Park. At first Big Bang consisted of 6 people, but one of his personnel had been killed (in the video documentary Big Bang episode 9) and were excluded. Before the release of their first album, Big Bang released 3 EPs in a row within a few months. They released their first EP, The First Single (29 August 2006) which produced the hit single, "This Love". The song "This Love" is a remake of the song "This Love" belongs American boy band Maroon 5. Single "This Love" sold 17 thousand copies sold in the month of August 2006, and further still sell approximately 40 thousand copies. Big Bang released a second EP, "Big Bang Is VIP", a month later on 28 September 2006, and sold over 21 thousand copies within one month. At the end of "Big Bang Is VIP" able to sell as many as 32,000 copies. On 22 November 2006, they released their third EP entitled BIGBANG 0 3, and successfully sold nearly 30 thousand copies. Still in the same year, Big Bang's fan club was founded under the name "VIP" (The name taken from the title of their second single, "Big Bang Is VIP"). Unlike other fan clubs, Big Bang fans do not have a special balloon colors to show their support for the Big Bang. In lieu of balloons, they waved a handkerchief or bandana black and white is the color of the Big Bang. In late December 2006, Big Bang held their first concert titled "The Real". In the following month they released their debut album Since 2007, which contains a compilation of singles previously circulated. Big Bang's debut album sold more than 48,009 coffee until the end of February 2007. On February 8, 2007, Big Bang released a concert album entitled The First / Real Life Concert which sold nearly 30 thousand copies by the end of 2007. From May to July 2007, Big Bang held their first Korean tour called "With You". Concerts are held in 5 cities: Incheon, Daegu, Changwon, Jeonju and Busan. In August 2007, Big Bang released Always as their debut mini album, followed by promotion and meeting fans. Group leader G-Dragon began producing and writing some songs for the album Always. The album was well received by fans and music critics, especially the song titled "거짓말" ("Lies"). "Lies" became the first song of the Big Bang are being hit exceptional. On the show SBS Hit Songs, "Lies" ranks first on 27 September 2007. The song was also ranked first in MBC's Music Core, KBS Music Bank and Mnet Countdown, as well as a number of online music charts and for several consecutive weeks. Big Bang to get a credit at the end of 2007, including Best Male Group and Best Song Music Festival event M.NET / KM 2007. In 2008, Big Bang won Award "Daesang" (Best Artist) from the 17th Seoul Music Awards. The second mini album, Hot Issue was released a few months after Always, and produce their next hit single, "Last Farewell" ("마지막 인사"). Like the previous mini album, "Last Farewell" was also ranked at the top range of the album charts. Of Cyworld, Last Farewell won the Song of the Month Digital Music Award, and was ranked the Juke-On the album charts for 8 consecutive weeks. Their second concert tour, Big Bang Is Great place from December 28 to December 30, 2008. Tickets sold out in 10 minutes. Due to too tired and injured in the concert, the members of Big Bang to be hospitalized, and their promotional activities to be delayed. However, Big Bang albums and singles continue selling should be reprinted. After the success in the country, Big Bang preparing to launch their careers in Japan. The first Japanese album Big Bang, For the World was released in 2008. The album contains songs in Korean, and Japanese speaking only one song, "How Gee" (remix new version of "How Gee" that had brought the Japanese group Black Machine). Their debut album in Japan to rank 14 in the Oricon charts, and stalled at number 10 due to lack of promotion. On 28-29 March 2008, Big Bang held a concert at JCB Hall, Tokyo Dome City. In addition, they also released a mini album in Japan in late May under the title With U. After their efforts in Japan ended, Big Bang returned to Korea in mid-2008. After several delays due to personnel solo activities Big Bang, they released a mini album-3, Stand Up. In the mini album, Big Bang collaborated with the group Daishi Dance. Together with Korean rock band No Brain, they produce rhythmic punk rock song, "Oh My Friend". From the mini album was released singles Day By Day (하루 하루). As with previous albums, G-Dragon is very involved in the production of Stand Up. All songs on the album are a creation of G-Dragon, except for "A Good Man" created TOP. Best-selling mini album Stand Up exceeded 100,000 copies, while the single "Day By Day" tops the charts ladder-South Korea for 6 consecutive weeks. At the same time, Big Bang released the Japanese-language song, "Number 1" from the same titled album, Number 1, and introducing their songs on various radio and television shows in Japan. Towards the close of 2008, Big Bang released a Korean album, Remember that produces 붉은 노을 singles ("Sunset Glow").